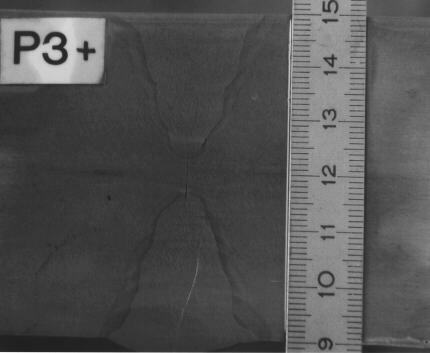 The ultrasonic testing method time of flight diffraction (TOFD) was applied to detect flaws at selected weld specimens of 15 to 60 mm wall thickness. The method was also tested at specimens consisting 1mm to 5 mm spark-eroded artificial notches. The TOFD results are compared with the detail results of the pulse echo method. The TOFD technique is able to detect defects within the middle section of the wall, but the results for near to surface defects are restricted. That means that weld defects which need to be recorded according to the established standard (e.g. HP 5/3), can not be detected reliably and in conformity to the new European draft standard. The defect sizing method is based on the of time of flight analysis of diffracted signals at defect edges. The principle underlying this technique has been well known for more then thirty years. Before analyzing a crack indication a defect detection is necessary. For the last few years the time of flight diffraction technique (TOFD) has been increasingly used not only for defect sizing but for defect detection as well. Many articles have been published detailing the use of the TOFD technique for defect detection of safety relevant welds and other safety related applications in the chemical industry  , in offshore applications, as well as in power plants and piping . 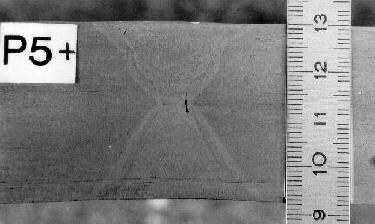 In some publications  the TOFD technique is also discussed as a replacement for X-rays and other ultrasonic testing techniques. However, some articles point out that TOFD should not be used for defect detection but for defect sizing. When TOFD is used in the inspection of turbine support rings, the detection of fatigue cracks is only possible in combination with SAFT post processing to differentiate defect indications from geometry indications. Based on the time of flight of the diffracted signals the defect size is predictable . Another publication mentions the uncertainty of diffractions useful in relation to crack geometry. This means that the echo signal reflected from the crack plane  must be used for defect detection. The European draft standard ENV 583-6, part 6: Time of Flight diffraction technique as a method for defect detection and sizing is scheduled to be discussed by CEN over the next 3 years. Input is invited from all CEN members; especially regarding the question of whether this draft in its recent version should be issued as a final European standard. This contribution presents results of a study investigating the performance and limitations of the TOFD technique. The results may contribute to a draft standard modification and completion, as well as restricting the TOFD technique to those applications where it can be applied as an element of a reliable inspection. Specimens and reference bodies of ferritic planar plates with and without welds have been used. 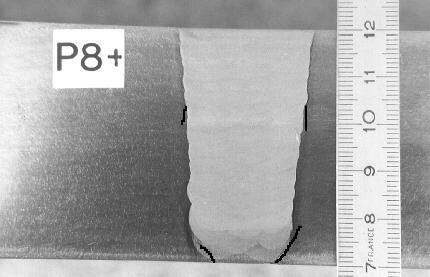 Notches, lacks of fusion and lacks of side wall fusion as well as a center line crack (P5) were implemented as detectable defects. Table 1 describes the plates containing welds which have been used. The position and depth of the defects were detected by magnetic particle testing at both top sides of the weld. Photos document the results (see Fig 1,2 and 3). Also the x-ray method was able to detect the defects. Artificial cracks were used for the simulation of lacks of fusion. P1 15 300 x 300 X-seam one side ground. centered lack of fusion, approx. 1 mm deep. P2 25 390 x 300 X-seam one side ground. centered lack of fusion defect, approx. 2.5 mm deep. P3 60 130 x 295 X-seam one side ground. centered lack of fusion defect, approx. 8 mm deep, local natural small welding defects. P5 38 100 x 300 X-seam both sides ground. centered crack over the whole length, approx. 2 mm deep. P8 50 120 x 327 U- seam both sides ground. lack of side wall fusion, perpendicular oriented defect, centered, 3 or 8 mm deep at both sides of the seam. Surface breaking cracks, inclination approx. 30°, 4 and 8 mm deep. The specimens with spark-eroded notches have dimensions of 63 mm thickness and 360 mm length. The notches are made at the outside surface, 1 mm and 5 mm deep and width of 0,1 to 0,2 mm. The 5 mm deep notches are perpendicular and inclined oriented at 0°, 10° and 20°. The registration level was adjusted according to a common Swiss code (SVDB) at a 2 mm cylindrical hole. The sensitivity level was adjusted at a row of 3 mm cylindrical holes. The specimen P3 with a centered lack of fusion was inspected by use of IE-technique. As comparison the seam volume was inspected with angles of incidence of +/- 45°, +/- 60°, +/- 70° and with different frequencies (1/2 MHz WB, 2/4 MHz MWB) using a meandering scanning motion. 1.2 dB above Reg. L.
/ dB above Reg. L.
---- dB above Reg. L.
The TOFD technique principle uses a single angle probe pair (45°, 60° or 65°) in a transmitter-receiver arrangement (V), conducted together. The necessary probe spacing relies on the wall thickness and is in accordance with the draft standard to ensure that both sound beams cross each other in the depth zone of suspected defects. Figure 4 presents the applied measurement arrangement. The probes with angle of incidence of 60° or 65° and a frequency of 5 MHz are connected together in a probe holder at a fixed position. The probe distance is adjustable. The probes are connected to ultrasonic equipment suitable for frequencies between 0,5 to 25 MHz. The transmitter provides a voltage of 400 V and was adjusted at 50 ns impulse. The amplifier provides a maximum gain of 112 dB. The RF A-scan signals are processed through a 8 bit ADC-converter with a maximum sample rate of 200 MHz. The ADC is connected to a fast digital computer interface.. The A-scan results are stored during the manipulator controlled scans and are post processed as B- or TD-scan images. Each A-scan provides a 512 pixel resolution. The pixel size can be minimized to 0.015 mm. The B- or TD-scan results can be presented as color or gray scale images. The measurement resolution is 0,5 mm. The 5 MHz probe characteristics are 65° angle of incidence for longitudinal waves, crystal diameter of 5 mm and a pulse length (train) of 1 mm. These probes are suitable for wall thicknesses up to 25 mm. For bigger wall thicknesses the 5 MHz probe with 6 mm crystal diameter and 60° angle of incidence is applied, for longitudinal waves. This probe provides a pulse length (train) of approx. 2 mm. The results presented show that the TOFD technique is able to detect defects in the wall middle of the weld seam and depending on the probe resolution for big enough defects it can be used for defect sizing. For the detection of defects close to the coupling's far surface the TOFD technique is less suitable; the detection of indications according to HP 5/3 is uncertain, if the inspection was performed strictly in accordance with the draft ENV ENV 583-6. The draft ENV 583-6 specifies only wall thicknesses bigger than 70 mm with the partition in depth zones. According to the draft standard specification it is sufficient to use one probe distance which focus on the middle depth zone for wall thicknesses of 50 mm and 63 mm (P8 and T63-1). If the TOFD technique is used for defect detection and sizing the partition of the wall thickness in deep zones should not be necessary only for wall thicknesses greater than 70 mm . The inspection according to the depth zones must be performed by scanning the weld with different probe spacing. In addition to the diffracted signals of the longitudinal waves, noise signals generated by mode conversion also appear (Fig. 6), thus the scanning with different probe spacing is helpful to recognize these noise signals with converted shear wave parts. Even optimizing the probe spacing, the TOFD technique cannot detect small defects positioned close to the coupling far surface, or those which are unfavorably oriented in weld center (see P1). For that reason TOFD technique is not an alternative to the Impulse Echo technique, but can be an addition. P. Kreier, F. Allidi, F. Walte, W. Gebhardt; Vergleich verschiedener US-Prüfverfahren an senkrecht orientierten flächenhaften scharfkantigen Fehlern; DGZfP Jahrestagung Kiel 1989, S. 497 - 506.